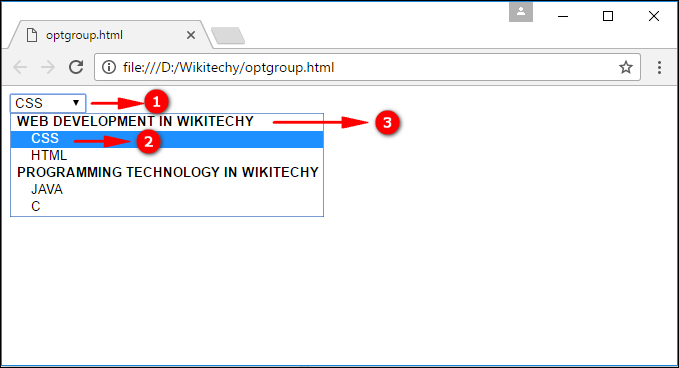 The <optgroup> tag is used to collect relevant options in a drop-down list within a <select> element. Whenever we have a lengthy list of options, groups of similar options are simple to hold for a user. The <optgroup> tag supports Global Attributes and Event Attributes. <optgroup> tag is used to group the related contents in a drop-down list. label is an attribute, which tends to describe the title/caption for an option-group. By clicking the dropdown list the option values is displayed in the option group. CSS, HTML, JAVA & C are the Option Values. WEB DEVELOPEMENT IN WIKITECHY & PROGRAMMING TECHNOLOGY IN WIKITECHY are the Option groups. label disabled Yes Yes Describes a label for an option-group. disabled text Yes Yes Defines if an option-group should not be shown.